This will be a year long remembered; it will see the end of the Skywalker saga, and the opening of Galaxy's Edge. Those happenings are only the beginning. 2019 will be a busy 12 months for Lucasfilm and Disney, and it is probably going to be the busiest time ever for Star Wars. I base that statement not only on the quantity of events, but on the significance of those events. There is a tidal wave of Star Wars coming, so I am preparing a ship to ride it. I need to get a grasp on the events to come, the information to be released, the parks to be opened, the products to be dropped, and the movies to be launched. I need to make a commitment to catch up and also stay caught up with it all as the wave surges through this calendar. Perhaps you feel the same way, too. If so, then I hope the following breakdown of the year's proceedings will help stay current with this deluge. As always, you must choose your own path (no one can choose it for you) in order to maximize your fun. There are fans who are trying to take in as much of the Star Wars media as possible, while others may focus on a particular one like comics or novels or the TV series that bring new stories to the franchise. Still others may go for a rewatch of the movies to prep for the final entry of the saga. I know there must be many who are planning their trips to Galaxy's Edge or to Star Wars Celebration. So, fellow fans, what will you be doing this year? As for me, I hope to catch up on all the TV series and rewatch all the feature films—at least. Whatever your plans may be, here are some of the goings-on each month in the Star Wars universe. Before I go through the calendar, I'm going to record running lists of questions that I hope will be answered this year. These include questions about plot points in the movies and questions about the outcomes of other events. I plan to retain these questions throughout the year and revist them each month to discover which ones have been addressed. I want answers! I will pepper each month's section here with some of these queries as part of the list of "Unanswered Star Wars Questions" or whatever I may end up calling it. Let's get started. 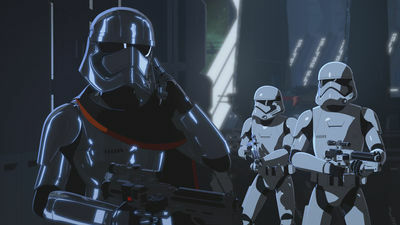 An image of Captain Phasma from the "Station Theta Black" setting in "Star Wars: Resistance." Photo by Disney. 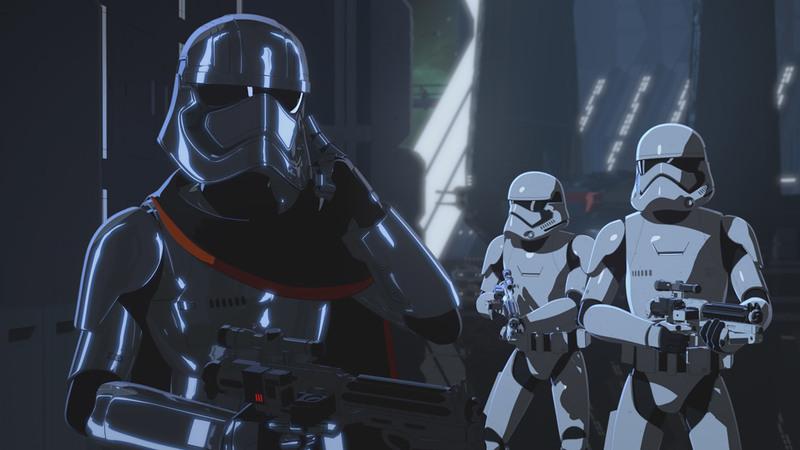 One of the highlights of this month is the finale of the first season of Star Wars: Resistance. December ended with episode 11 followed by a series of shorts on Disney Channel's YouTube account that set out to bridge the story until the next full episodes. These last three regular episodes ("Bibo," "Dangerous Business," and "The Doza Dilemma") all broadcast this month. It will be interesting to see how close the stories get to overlapping the timeline of The Force Awakens. The ending will more than likely end in a cliffhanger to set up season 2, the start of which has not been announced. A new kids' book released January 8 tells the story of a bounty hunter named Bazine Netal seeking infamous smuggler Hondo Ohnaka (whom we will meet in Galaxy's Edge somehow). She finds him at the Black Spire Outpost on Batuu, the site of Galaxy's Edge itself. Star Wars: Pirate's Price follows Bazine as she takes in the site of Black Spire and locates the Millennium Falcon. Through stories like this one and Thrawn: Alliances, the history of Batuu is building up its own lore. For guests not familiar with every detail of Star Wars canon, Galaxy's Edge will still be a fun place to visit. It will be a fun experience for Star Wars freaks as well who may find a few more details and Easter eggs derived from media like this. 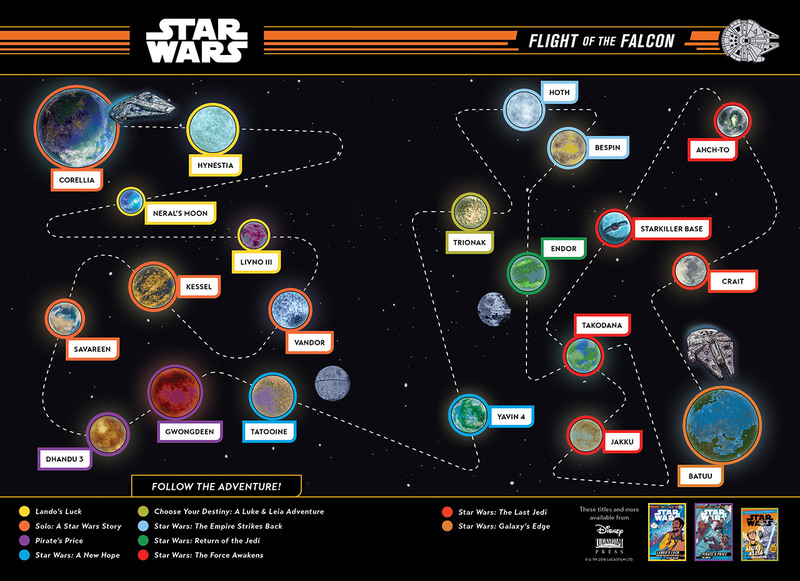 This book is part of a series called Flight of the Falcon and includes a fascinating map that traces the location history of the Millennium Falcon through these stories, the movies, and eventually to Galaxy's Edge. Map from the "Flight of the Falcon" book series that shows locations of stories throughout the ship's history. Photo by Disney. And here I start my running questions. Will this season end with more new connections to The Force Awakens? How close will it get in time to the start of that film? What event leads to the Kaz's full realization of the First Order's threat? This month will also see the beginning the Age of the Republic comic book series that includes single-issue stories featuring a particular character. Already out is Obi-Wan from January 2, which tells about his early training of young Anakin. There will be a Jango Fett edition on January 9, and a "special" edition issue of several stories due out on January 16. For some deep dives into the lore of Star Wars and for stories that fill in the gaps of the timeline, the comics are rich in their additions to the canon. 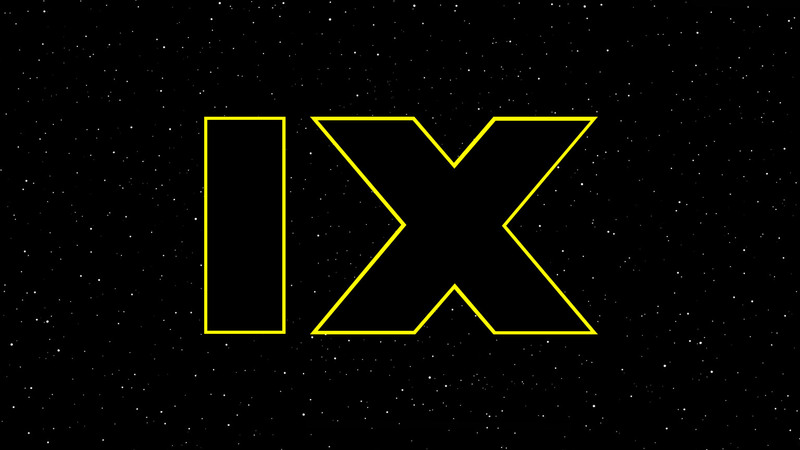 If there hasn't been a trailer or title-reveal for Episode IX already, then hopefully one or both of those things will show up in February. Predictions? I'm terrible at guessing the titles but I have a feeling the word "final" might be in it. But the word "last" was in the previous title, so perhaps not "final." Mark Hamill joked that it would be called, "From His Nap," to complete the phrase: "The Force awakens the last Jedi from his nap." Any real ideas out there? Would "Balance of the Force" be suitable? The Age of the Republic comics continue in February with Anakin Skywalker on the February 6 and Count Dooku on February 13. It will be interesting to me to see how the Anakin one will connect with the Vader series that has been running recently, if at all. I'm guessing it will connect more with January's Obi-Wan story and give Anakin's point of view. While shooting for The Mandalorian has already begun for the upcoming Disney+ online video streaming service, I imagine the production will continue in these early months of the year. We may get trickles of information from the show's writer, Jon Favreau, just as he did last month on Instagram with his picture of the bounty hunter IG-88 from The Empire Strikes Back. Perhaps we will get more bounty hunters or other side characters we've seen in the films. Here's hoping for a Long-Snoot (Garindan) cameo with his intimidating speech patterns. What is the origin of Pedro Pascal's Mandalorian? Is there any connection to Boba Fett? Will Boba Fett appear? What other bounty hunters (besides IG-88) will appear? The following month is "Star Wars Celebration" so I imagine there will be some reveals about the convention this month. We will know more about who will be appearing and what other presentations are in store. At this point I will debate whether I should/could get there or not. Also coming is Vader Immortal, a virtual reality game for Oculus Quest that has a "spring" release date, so it could be March, or Smarch. I believe you face Darth himself in the game and it sounds quite intimidating and awesome. Spend money on this or on Galaxy's Edge or on Celebration—goodbye wallet. A new novel by E.K. Johnston, Queen's Shadow, comes out March 5 and takes place after The Phantom Menace when Padme moves from Queen of Naboo to Senator from Naboo. The link goes to an interview with the author where she shares her hopes to dive into the mind of Amidala and show "her brilliance and her political acumen." The Age of the Republic comics will continue with General Grievous (March 13) and in time with the novel, Padme Amidala (March 6). A new series on Darth Vader will debut with Vader: Dark Visions. Will there be a trailer for Ep 9 here or before Celebration? What cast members will be present? April will center around "Star Wars Celebration" in Chicago from March 11–15. There will be appearances by actors, presentations by makers of the film (like J.J. Abrams), panels about toy and memorabilia collecting (organized by Gus Lopez), and new footage of Episode IX such as a behind-the-scenes video like both previous episodes have done. There will be so much going on and a lot of news to circulate so I'll be hard-pressed to keep up with it all. I'm guessing there will be some Galaxy's Edge info popping up there, too. A new novel by Claudia Gray, who wrote Bloodline (about Leia's actions after Return of the Jedi), will be released titled, Master & Apprentice. An excerpt was in the book A Certain point of View. Indistrial Light & Magic will release a Making of Solo book by Rob Bredow and he will be at Celebration to talk about it. Both of these books are due out April 16. Was there a trailer shown? What cast members were there? What new information did we learn about future SW films and shows? What did we find out about Galaxy's Edge? 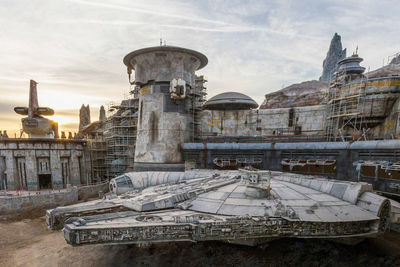 Construction of Galaxy's Edge and the Millennium Falcon in Disneyland. Photo by Disney. Is May the opening month of Galaxy's Edge in Disneyland? It seems most everyone now is saying it will open in June, but May has some history to it that would be nice to tie in. The first movie came out 42 years ago (22 years since its re-release) and this will be the 20th anniversary of The Phantom Menace. This seems like a great opportunity to open the park at this time and add to the heritage of Star Wars in May. There will be three entrances into Galaxy's Edge: Near Fantasyland, from Frontierland, and from Critter Country. I'm glad there isn't just one, or else it would have been the galaxy's largest bottleneck. The design of Black Spire Outpost was influenced by Imagineers' visits to Morocco and Istanbul. From the beginning they wanted that "lived-in" look to the location like the original "weathered" aesthetics of the movies. We've seen photos showing this kind of design but it is worth noting since it fits with scenery from the films. There will be some real trees. I shouldn't be surprised at that fact; I guess I thought the trees would be fabricated so they would look alien. We need a touch of nature here, if it is a far, far away place. Millennium Flacon Smuggler's Run: The story centers around Hondo Ohnaka who has made a deal with Chewbacca to use the Millennium Falcon and we are his temporary pilots. Groups of six will ride in the cockpit and all those buttons and switch actually do things. Talk about needing to ride multiple times to figure all that out (unless you're Han Solo). Characters in the park will interact with you about your performance and that kind of experience is an opt-in or opt-out opportunity. That makes me believe it will be an additional cost. Get out your Republic Credits. Rise of the Resistance: The queue has a themed interior of a Resistance base. That's cool, especially since the wait will be long and it starts in Bakersfield, CA. Guests are then captured by the First Order and try to make their escape aboard a transport, which is the trackless ride car. Sounds good. Can't wait to see those life-size AT-ACTs! Oga's Cantina: Capacity concerns are somewhat/questionably addressed; they're making it standing-room-only (mostly). There are booths around the outer parts of the space and there is no word on possible reservations of those tables. I'm not sure if this will help control crowds: just making them stand? It might be so cool that fans won't mind standing around for a long time. Maybe you'll line up, get to the bar, order your drink (a "Fuzzy Tauntaun" could be the name of a drink--I discussed other possibilites from old post), get it, and "move along." Let's hope it doesn't get so crowded that people's arms get chopped off or people shooting first. Blue milk is confirmed to be on the menu—not just in the Cantina, but at many stops around the land. Of special note is that the blue milk will be a non-dairy drink. I'm surprised but also glad for us lactose-free folk. Shopping: All shops will get its merchandise from a central stockroom (and restaurants from a common kitchen) for efficiency. That just makes sense! There will be a shop where you can build your own droid as part of an interactive experience. You can imbue your droid with a variety of traits like a fear of Stormtroopers (they'll respond in the park to costumed characters). Another shop will feature an animatronic Dok-Ondar (a character mentioned in Solo: A Star Wars Story) in a booth that cast members (and maybe guests) can interact with to haggle for prices like in a marketplace. Finally, merchandise may be sold in themed packaging to look like it's from Batuu and not like buying Star Wars toys from a department store from Earth. Nice touch! How was the crowd size? Reactions from fans and press? Implications on Walt Disney World's opening? Star Wars: Galaxy's Edge | Behind the Scenes at Disneyland Resort and Walt Disney World Resort. Disney Parks YouTube Channel. If the park didn't open in May, it will probably open in June. See above. July 23 will see the relase of the novel, Thrawn: Treason, a sequel to Thrawn: Alliances, by Timothy Zahn. Thrawn must deal with the battles for power in the Empire as its dictator, Palpatine, shifts priorities to their super weapon, the Death Star. This puts Thrawn in the middle of hard decisions about his loyalty. Fans of this sinister character, and of Zahn's books, are sure to enjoy this story that complicates the famous Grand Admiral. Not sure about this month. I believe all things at this time will be leading up to next month. 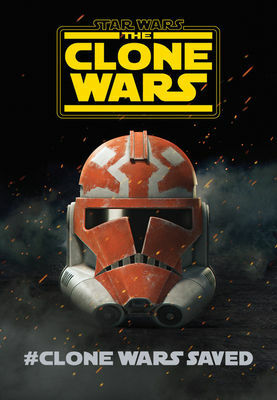 #CloneWarsSaved teaser poster for season 7 of "The Clone Wars" that will premiere on the Disney+ online video streaming service. Photo by Disney. The Disney+ online video streaming service begins. It doesn't seem that there will be any Star Wars content at its outset, but the start of the streaming service will be a huge addition to home entertainment. It will start the process of bringing all Disney franchises into one place. Eventually Star Wars films and shows will all be here, as well as Marvel programming. I may not make it to the opening of Galaxy's Edge, but I'll be a Disney+ guest from day one. So, will there be any Star Wars stuff in September? There is no official word on yet on The Mandalorian's start and many are guessing it may not premiere until 2020. We also don't know when season 7 of The Clone Wars will debut, but it is set to come to Disney+, too. There's also the untitled Rogue One prequel series about Cassian Andor (reprised by Diego Luna) that will come out much later. I'm looking forward to these live-action treatments. While there isn't official word, it's probable that "Force Friday III" will happen in September. It has taken place two times before when both The Force Awakens and Rogue One were close to opening. This "Force Friday" would begin shopping season for toys and media tied to Episode IX and with that, it will reveal characters and vehicles and other tidbits from the new film that I'm sure we will all examine closely. Finally, we'll have a new Lando figure. And more porgs. Any surprise Star Wars content in Disney+? As mentioned above, Disney+ will host a series centered on Cassian Andor and in October, the show enters production. I wonder how much we will hear about it. And I wonder where I could audition? Will Darth Vader be in it? Emperor? If so, will it touch on the scourge of the Jedi? Will we visit Vader's castle? Any involvement by Galen Erso or Director Krennick? Bail Organa to be involved? Mon Mothma? How did we get from Clone Troopers to Stormtroopers? Will Galaxy's Edge open in Walt Disney World? Will they wait until December? Will Interstate-4 be gridlocked? Will lines spill out to the Everglades? A new video game from Electronic Arts will have a "holiday release" (which could mean November). "Star Wars Jedi: Fallen Order" takes a new approach apart from the Battlefront series. At least, I think it will be a new approach, I haven't seen much about it. I hope it has a better start than "Battlefront II" did. All we know about the title of Episode IX is this image and our imaginations. Photo by Lucasfilm. 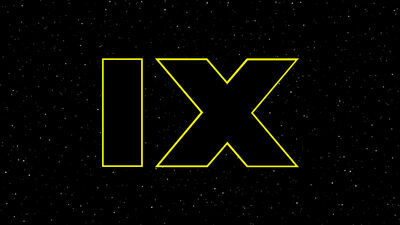 My most anticipated event is the wide release of Star Wars Episode IX on December 20. I will approach this movie much like I did in 2005 with Revenge of the Sith with mixed emotions. Back then, I thought Star Wars was all but over. This time, it won't be the end of Star Wars, but it will be the end of an era. The most I had ever hoped for the Star Wars saga was nine movies. Even though George Lucas said in 2005 that six movies was the finished saga, years before the prequel trilogy he said there would be nine total movies to tell the whole story (some sources say at one point he said twelve, but I never read that myself). So, to me, nine makes it complete and it will be bittersweet to witness the ending of this Skywalker saga. I'm pleased that there will be more feature films coming like the trilogy from Rian Johnson and another separate trilogy by D.B. Weiss and David Benioff, so it's not like I'll be without any new movies. However, this is the core of the entire franchise, these nine movies. It will come with a sense of finality and from then on, all Star Wars stories will, in a sense, be free to exist on their own. As I've said in previous articles, I will try not to think too hard about the plot lest I set up my expectations too extreme or accidentally make a good guess that spoils the plot for myself. Yet, I wonder what will become of these beloved characters? I have the highest hopes for Rey, that she will discover all the truths about herself and the Force. I sense darkness for Kylo Ren. I will hold my breath for my final journey with Leia. I wish for some last words of wisdom from Luke. I want something cool from Lando. I want good to triumph and I want to know what it means to have balance in the Force. I want the ending to be like Luke's ending, not sadness or pain, but peace and purpose. How will Rey get a new lightsaber? Or will she reconstruct Luke's? Will Luke appear as a Force Ghost? (or others like Yoda or Kenobi or... Anakin?? Will Kylo Ren be redeemed or will he destroy himself? How will they address Leia's final moments? Will Poe then lead the Resistance? Will the Galaxy get behind the Resistance and finally end the First Order? Will there be a cliffhanger of any kind? What will Rey do and learn from the Jedi texts? I am sure there are some details I've missed, but I hope I've covered the majority of events for this auspicious year. I have a lot of questions but as things tend to go, answers only bring more questions and I'll follow-through with those as we journey through these months of promise. OK, enough planning. Let's dive into this big year, ride the wave, and be immersed in the Star Wars realm. Ben, tell 'em I'm ready! I'm excited, too. But I also laughed a little while reading that the big thing in April starts on March 11th and ends on March 15th. If you're thinking in March about whether or not to go to Celebration, it's probably too late. Many of the tickets are already sold out, and more, if not all, will likely be sold out by that point. As noted above, your April dates for Celebration are actually March dates. May - There are definitely three routes from Galaxy's Edge to the outside world, but has it been confirmed that all will be entrances? The article you link doesn't mention where that info is coming from. Last I heard, at least initially, there will be one entrance and two exits. August - D23 Expo is August 23 - 25 and there may be Star Wars related info during the Expo, especially about Episode 9. Ah dang it! "You said you wanted to be around when I made a mistake; well, this could be it" said while I was flying through an asteroid field. Yup, that is supposed to be April 11 - *April* (I missed it twice, what are the odds, don't tell me) 15th. Perhaps if I did decide at the last hour to get to Chicago (in *April* - sorry about that) I would have to hope against hope to get in and maybe find some scalpers or leftover tickets from no-shows.